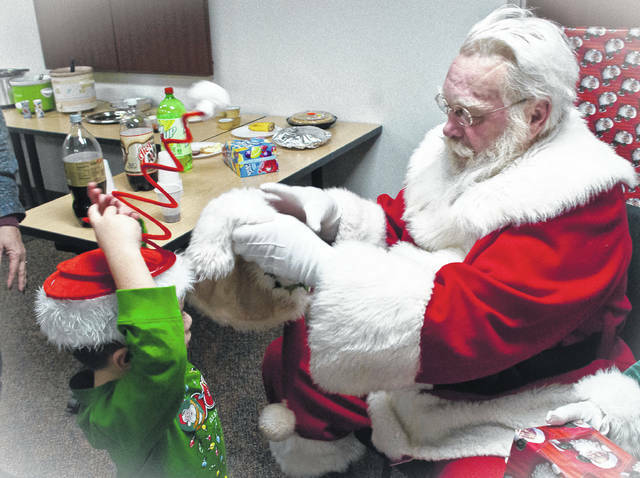 During the MOMS Christmas dinner and party, Santa Claus offered to trade hats with 3-year-old Akaidus Trejo. Trejo wasn’t sure what to think, but he made the trade anyway with the Jolly Old Elf. There were nothing but wide-eyed children looking around for which way the sound of jingling bells was coming from when all of a sudden Santa and Mrs. Claus appeared at the Moms Offering Mentoring Support’s Christmas dinner and party. The program matches experienced mothers with young moms to teach them how to care for children by connecting them to community agencies and helping them to develop life-coping skills. The program is sponsored by the Delaware County Juvenile Court. Cram said the focus has shifted from first-time teenage moms to any mom seeking advice and help in Delaware County. She also said there is no age requirement nor is there a limit on gender because the group accepts fathers as well. She said there are a couple of fathers currently in the program. “They came in with their first child and then number two might of come along and if so, they just stay,” she said. Cram said the idea is for moms in the program to become mentors. She said the young moms are taught to give back. “I think I have five now that have gone on to be mentors themselves,” she said. Megan Dillman, assistant to Cram, matches young moms to mentors and trains mentors. Holly Miller has been participating for seven years. She said she has been paired with different mentors and learns new things with each because everyone has different methods of raising children. Cram said funding for the program comes from the Juvenile Court, the Women’s Shelter and various other resources. Dillman said all potential mentors must go through an extensive screening process, including a criminal background check and drug screen. Potential mentors are required to attend a training session. Once matched, mentors will be required to have contact with the young mother and infant until the child’s first birthday. This entry was tagged Cram, Delaware County Probate Court, Dillman, Juvenile Court, Mothers Offering Mentoring Support. Bookmark the permalink.